As the outdoor product market continues to expand, finding the space to fit all of your gear is becoming increasingly challenging. Traveling by car might be limiting when it comes to space, and some solutions for this issue are both expensive and might cause additional problems. We’re going to discuss something that we consider to be a very simple and smart way of expanding your storage space, namely the cargo carrier hitch-mounting system, a convenient and affordable way of ensuring that you can bring all your equipment on your camping trips or vacations. Capacity. How much stuff can you fit on your cargo carrier (or in your cargo carrier)? As the only reason for buying such a device is to increase storage space, bigger will almost always mean better. Utility. What type of system are you looking for? A hitch mounted enclosed cargo carrier will allow you to mount it and pack your items right away, as opposed to a hitch cargo carrier with ramp, which is mostly for bringing more heavy-duty equipment, such as a portable generator. Materials. As far as materials go, this isn’t going to be such an important factor, but still worth mentioning. Aluminum is probably the best choice when it comes to ramps and basket-type carriers, while plastic proves to be superior to other fabrics used in manufacturing enclosed cargo carriers. Value. is it worth the money? Sure, it might be an awesome product, but is it twice better than something that costs six times less? Let’s start the review and see if we can find something that’s going to suit your needs! The THULE Transporter is one hell of a carrier. Thule is a company that mainly produces sport and sport-related gear. With that out of the way, they’re also responsible for manufacturing bike racks and roof racks, so they’re clearly interested in vehicle storage accessories. The Transporter Combi has a rough plastic body and seals shut, making it almost 100% watertight – ideal for extreme environmental conditions. The rough plastic makes it very reliable and will allow safe storage for anything that will fit, and finding stuff that fits isn’t a problem. The Thule Transporter Combi can fit up to 150 lbs (13 cubic feet) of gear and/or supplies. In addition to that, it can be installed on 1¼-inch and 2-inch receiver hitches, class II or III, so it can be used with most vehicles. This hitch mounted enclosed cargo carrier is also safe to use, as it has its own lighting system and includes a plate adapter to offer maximum visibility. The only drawbacks that it has are the price – this product is very, very expensive. While it’s a great, durable product, the fact that it costs so much really dims down the value of the Combi. Another letdown, although not as big, is the fact that it’s not waterproof – during heavy storms, you might see some leakage, but not a lot. 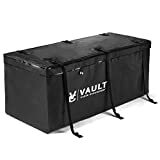 Vault Cargo Management product a variety of products that are meant to offer better, safer storage conditions, such as straps, shackles, snatches and more. 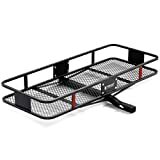 We’re going to be looking at the Cargo Hitch Carrier (60 x 24), a nice choice for you guys out there that maybe want to bring a refrigerated case on the trip but can’t really use an enclosed carrier for that. Now the size isn’t that big, but you’ll be able to fit a cooler, a tent and maybe some bags in there too if you’re lucky. This cargo carrier hitch-based system acts very much like a basket, so you’ll need straps to keep your things in place. It’s made out of steel and the storage rack is pretty good at keeping things in place. The elevated shaft allows it to be mounted above your exhaust, for safety reasons. It’s compatible with 2” receivers, so make sure that you have a compatible hitch before you purchase it. It’s also non-folding, so make sure to uninstall it before parking, as it does take up a bit of space. Let’s take a look at another basket-style cargo carrier – the CURT 18153 (not a very catchy name). The people at CURT manufacture a lot of hitches and hitch-related accessories, so you’re in good hands when going with this basket. The CURT basket isn’t very big, so at a first glance, it’s a bit inferior to the previously mentioned Vault cargo carrier. With 33.5 x 28 x 10.5 dimensions and 71.4 pounds, it’s a bit on the heavier side, but nothing that your vehicle can’t handle. It still offers plenty of room for most of your equipment, and the 6” tall sides do offer better support for your belongings. Around the same price point as the Vault cargo carrier, this hitch cargo box, and luggage carrier features a folding system, so you can lock it in a vertical position for when it’s empty or unused – a very nice feature to have, especially for people who are traveling on a weekly basis. If you can cope with the smaller size, we would recommend picking this one up over the Vault product featured above. Now that we’ve presented you with some carrier baskets, let’s take a look at some bags to mount on top of them. 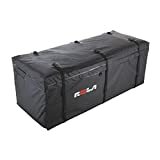 The ROLA Rainproof Cargo Carrier Bag is manufactured by ROLA, a company that’s very active in the outdoor camping and sports market, so these guys know a thing or two about how a cargo carrier should look like. This rainproof hitch cargo box fits baskets from 60 x 24 and above, so it goes perfectly with the Cargo Hitch Carrier by Vault. It comes with a six strap system that makes it lock in very nicely, so just focus on the road – this thing isn’t going anywhere. It’s water resistant and pretty sturdy so your belongings won’t suffer any elemental damage. Very affordable, even when purchasing a basket hitch carrier to mount it on. This brings a lot of value to the table. Another cargo carrier basket, this time made by MaxxHaul. MaxxHaul manufactures a lot of hitch-connecting storage products, so they’re seasoned pros of the industry. This Aluminum cargo carrier is a testament to their professionalism and attention to detail. 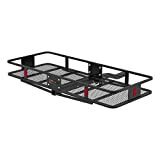 First of all, an aluminum hitch cargo carrier is one of the best choices when it comes to build quality. Very rigid, it won’t bend at all if used following the manufacturer’s specification. Although we don’t think 49” x 22.5” of space is that much, this is still a good pick if you don’t need a lot of extra space. Cheap and resistant to corrosion, make sure you pick one up if you’re not looking for something extra-big. This can also hold up to 500 pounds in weight, so you can probably throw anything at it. Another Rola product, this time a carrier basket. What’s nice about this particular product is that it’s made using 2” thick steel, making it very, very durable and impervious to damage. It comes designed with a rise shank so that you won’t have to worry about obstructing the exhaust pipes and bringing harm to your luggage and belongings. It’s not too big, so most cargo boxes won’t fit, measuring at 48” x 28” x 11” after being assembled. It is a bit more expensive than what we’ve featured so far, but it does have some added benefits, such as attachment points for your license plate and an optional lighting system. The lighting system isn’t a must, as this carrier isn’t likely to obstruct your vehicle’s lights. The Vault Cargo Hitch carrier bag is a nice product that goes really well with the Vault hitch basket, our second featured product. This time, we’re going to talk about an all-around great carrier bag, great for protecting equipment and supplies from rain, dirt and other environmental factors. It measures at 59” x 20” x 20”, smaller than some bags on the list but still pretty big for some of the hitch baskets that we’ve reviewed so far (although not all, as it’s a perfect match for the Vault Hitch Cargo Carrier). It’s made out of very resistant fabric, making it waterproof and tough, perfect for dirt roads and other tougher conditions. It’s actually pretty cheap, and if you buy it along the Vault Hitch Cargo Carrier, you’ll be getting a really great deal! The 15 cubic feet of storage provides plenty to shelter a lot of gear and equipment and the 6 straps make it lock in place. Another great aluminum cargo carrier from MaxxHaul, this time with a twist – this is an aluminum hitch cargo carrier with a folding ramp, great for transporting a small power generator and any other small-wheeled equipment. Aluminum is a very quality material as it gives the products corrosive-resistant properties and it makes it durable and lightweight at the same time. The portable ramp offers a lot of utility and it’s foldable, so you won’t even notice the extra length. This is even great for mobility devices, so you can consider taking a disabled relative of a friend to accompany you on your next trip. You’ll need to get straps yourself if you want to add some extra security measures to your luggage. That’s being said, this is an all-around great product and it’s one of the best ramp carriers on the market. Made by Five Star Manufacturing, a small company that produced a couple of trailer ramps and hitch carriers, but they’re all pretty great. Moving onto the carrier w/ramp 32”W, this is pretty wide and spacious, so you can fit a lot of stuff onto it. Maybe you’d like to bring your own grill – this hitch cargo carrier with ramp is perfect for anything with small wheels, so some barbecue grills are no-brainers. It’s good to transport luggage and equipment up to 300 lbs, which isn’t that great, as most of the other carriers can easily carry 500 lbs. Made in the USA using 2” square tubes, this is a pretty lightweight and strong hitch carrier. The only real issue that it has is the very high price point. With very little improvement over the MaxxHaul aluminum ramp carrier, this isn’t such a good deal. Whether you’re going camping or you’re just on the market for some convenient storage methods for equipment, gear or machinery, most of these products (although not all) are bound to be suitable for you. They’re all made using quality materials and all of the manufacturers are established industry brands with years of experience to back them up.